Rehabilitation services refer to a system for guiding and supporting offenders and delinquents in rehabilitating themselves to become sound members of society.Today,the system of rehabilitation service is wide-ranging and diverse,consisting of(1)examinations and decisions on parole etc.,(2)supervision of probationers and parolees,(3)urgent aftercare of discharged offenders from physical constraint under criminal procedures or protective measures,(4)work related to amnesties,and(5)support for crime prevention activities in communities. This chapter will give an overview of the system and administration of rehabilitation services.Parole and probation supervision etc.are also described in Part5,Chapters4and5. Fig. 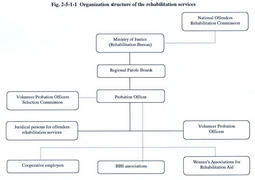 2-5-1-1 shows the outline of the organization structure of the rehabilitation services.